Sashimi is a great way to enjoy seafood. Without the rice, the true essence of the fish comes through, and with just a dab of shoyu to enhance it, this is the purist’s dream. Some fish take very well to being served in this style, particularly the fattier cuts of tuna, toro, chu-toro, and o-toro. Live scallop sashimi (taken right out of the scallop shell) is, for example, an exquisite treat, and has a comparably different taste and texture than the scallop normally served as sushi. This item, and some like it, should only be served as sashimi. 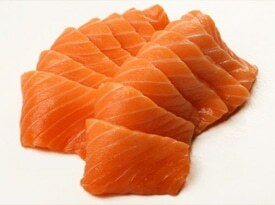 Sashimi is actually the most simple style to make. Many Japanese markets have pre-shaped fillets ready for sushi and sashimi. This is perfect for making sushi at home because it means less work and less waste. Often, the fillets are approximately 1 1/2 to 2 inches wide and anywhere from 1/2 to 1 inch high. The length varies, but they can be a few inches long to up to 6 (usually). If these are not available, try to trim your purchased fish into something along these lines. It doesn’t need to be perfect, and in fact, you can make sashimi just about any shape you want, the consistency and perfection sought in sushi restaurants is primarily for presentation. At home… who cares? To make sashimi, simply cut the fish against the grain into pieces approximately 1/4 of an inch thick, retaining the previous height and width proportions. The grain of the fish is usually readily apparent, so this should not be difficult. Generally speaking, the larger steakfish are well suited for sashimi as they are easily cut into the rectangles people expect to see as sashimi. Smaller, lighter fish are harder to serve this way, however have sashimi styles of their own. Ika (squid) for example is often scored and piled up folded over on itself when presented sashimi style on a plate. But again, eat what you like how you like it. Sashimi is often served with shiso and daikon as accompaniments. These are generally for aesthetic purposes, however I love to munch on the daikon with my meal.